Townies it’s time to make the long drive out to the north shore to Turtle Bay Resort and check out the best bar you’ve never been to – Surfer The Bar. First there was Surfer the magazine. Now there’s Surfer the bar – except it’s more than a bar, it’s a true original, located in the flashpoint of global surfing, Oahu’s legendary North Shore. 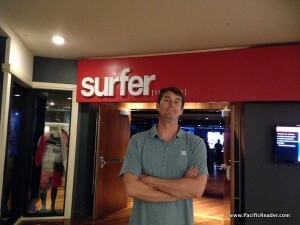 Surfer is a partnership between Turtle Bay and Surfer magazine. 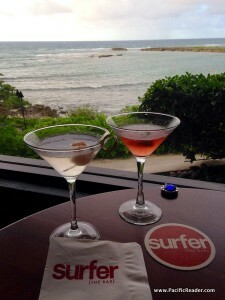 Sorry bars in town, but Surfer The Bar has got my vote for best bar on Oahu be based on my love for the ocean and its Surfer Magazine themed décor, happy hour specials, live music, and their Talk Story segment with famous surfers and ocean minded icons like Jerry Lopez and Nainoa Thompson. Surfer The Bar is more like a sheik Los Angeles bar without the strict dress code. Come in high heels or your flip flops! The service is also friendly and full of aloha. I love the wall of glass windows that face the ocean giving all the customers a stellar ocean view. My favorite thing about this bar is the daily happy hour from 6 to 7 pm. They offer drink specials like $6 speciality drinks. 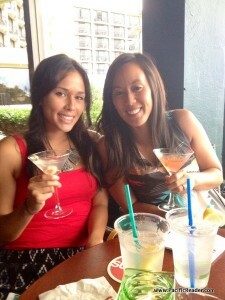 My fav is the V-land martini made with Absolut Mandrin, Cointreau, cranberry juice, and fresh lime. They also have food specials like Volcano Chicken Wings and Hamakua Mushroom pizza. Another gem about Surfer The Bar is their choice entertainment. They have live music regularly by favorites like Paula Fuga and even do open mic nights. During the winter surf seasons, this place turns into an all out raging party! Surf celebs, locals, and tourists all gather to dance and have a great time. The most exciting thing about this bar, with its big screen stage, wicked audio, and laid-back aesthetic is that you never know who’s going to drop in, which makes Surfer one of the most original and engaging places in the universe.